The Tiger Depackaging System, available in North America from Ecoverse, now comes in five different size configurations. This technology is designed to remove 99.6 percent of contaminants from organic fractions and is specifically designed for food waste and packaging recovery operations. Applications include composting anaerobic digestion, animal nutrition, recycling and repurposing. "We now offer Tiger Depackaging Systems that manage material anywhere from 1 ton per hour to 40 tons per hour and everything in between," says Corey Rossen, Ecoverse's food/organic waste division manager. "The Tiger can help organics recyclers and companies or municipalities handling food waste save money, increase efficiency and raise production levels, while lowering overhead costs." The electric-powered Tiger is available in sizes ranging from the Tiger HS 5 Low Profile model (with capacity up to 10 tons per hour) up to the largest sized option, the Tiger HS 20 (capable of processing up to 40 tph). These units feature low maintenance, a compact footprint, plug-and-play operational design, and are available with a wet-, dry- or dual-organic discharge system. Units also feature bolted-on replaceable paddles, a large stainless steel hopper, an anti-bridging dual-feed auger system for increased production, integrated CAN-Bus system, adjustable water controls and a fully accessible panel design. The Tiger uses centrifugal force in a vertical mill, with either a 1/2-inch or 3/4-inch screen. Separation takes only a few seconds, and rotor speeds are up to 950 rpm. 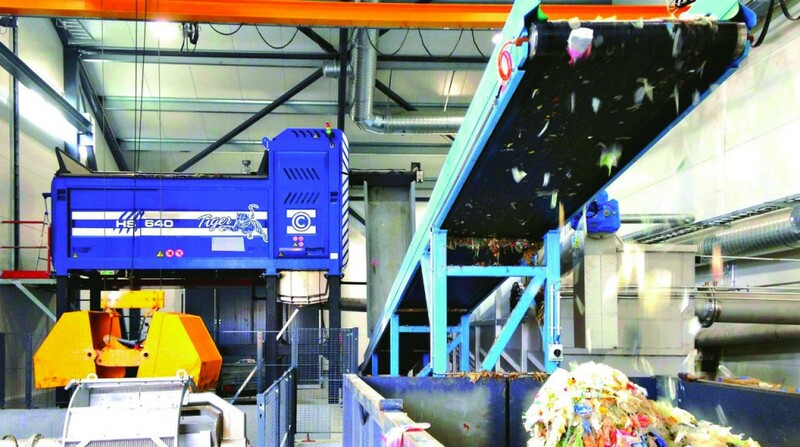 "These units are designed to help increase compost quality, renewable energy production and the value of recovered recyclables, while significantly decreasing organic contamination levels in food and packaging waste processing applications," says Rossen. "The Tiger depackaging system allows for efficient separation of organic and inorganic fractions from off-spec food, post-consumer food, source-separated organics (SSO) or other packaged waste, resulting in less than 0.5 percent organics contamination." Rossen adds that precise control over water content in the final organic fraction is also provided. "The Tiger works in multiple processing capacities, including wet, dry, and dual (wet/dry), with just a simple, one-switch change from wet to dry or vice versa. "These machines also promote higher capture of materials such as aluminum and plastics from food waste and packaging streams," says Rossen. "Pre-treatment of materials using Tiger technology in organics recycling, animal nutrition, composting and anaerobic digestion applications, can increase production rates by 30 to 40 percent."